This sweet baby girl is looking so pretty in pink! 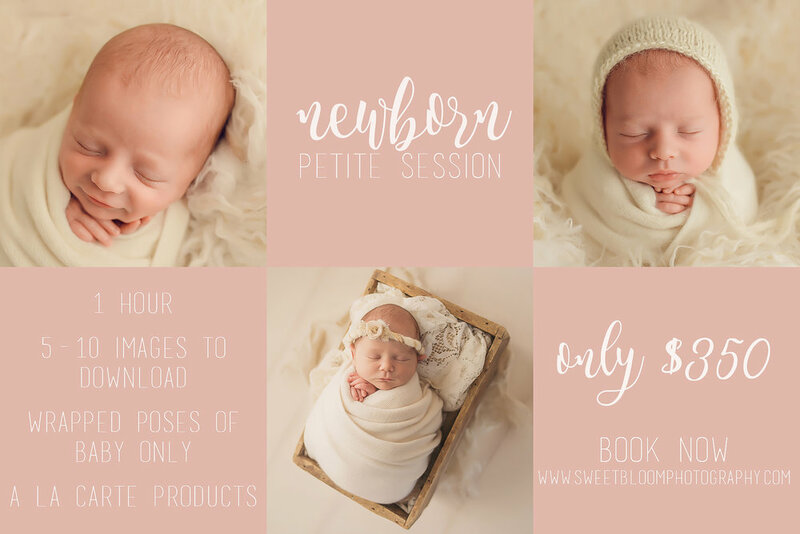 Newborn sessions take place in my cozy in-home studio located in Lexington KY. My studio is overflowing with vintage props, cozy wraps, organic hats & headbands, etc. You don’t have to worry about bringing anything for your session, we will take care of it all! We offer 3 different newborn session options: Petite, Keepsake & Heirloom. Sweet Bloom Photography is an award winning newborn photography studio located in Lexington Kentucky. Our cozy in-home studio is stocked with everything needed for your newborn session, including hats, headbands, wraps, vintage props, etc. 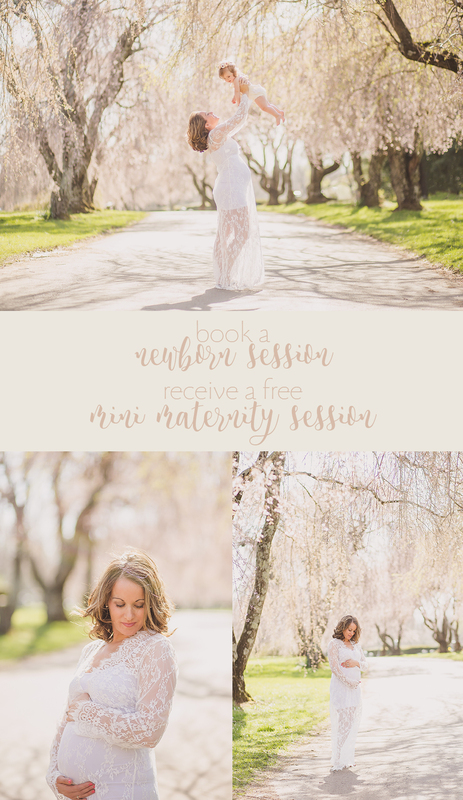 We also offer baby & maternity sessions, both in-studio and outdoors at a park, field, etc. 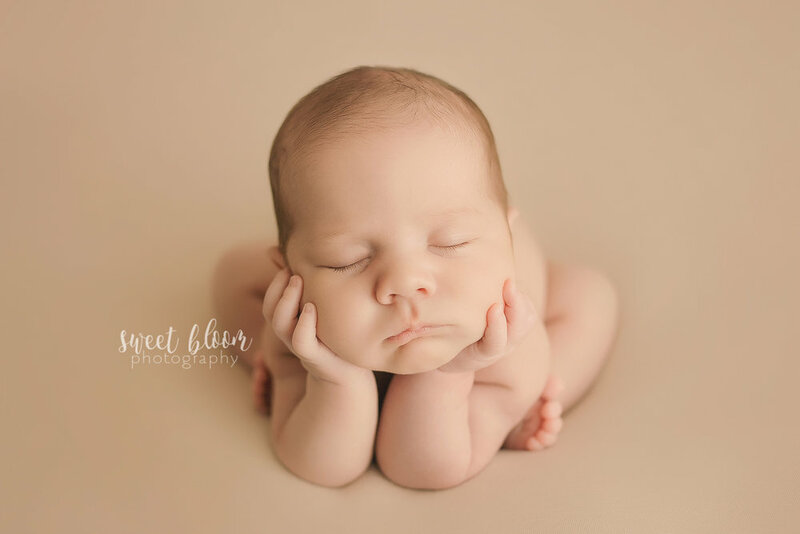 Newborn sessions are best between 7-14 days old, when your baby is still sleepy :) Since the actual arrival of your little one is usually pretty unpredictable, we hold space on the calendar for around the time of your due date. Then, one your baby is born, we will schedule a date/time for your session. You will also receive a Newborn Session Prep Guide that is filled with everything you need to know to help plan for your session. To hold your due date on our calendar, a completed policy agreement form and payment of a $200 non refundable retainer are due at booking. Having twins come into the studio for their newborn pictures was so much fun! I love photographing twins and always have an assistant to lend a helping hand for these sessions. It is my job to keep your babies safe at all times! Newborn sessions take place at our in-home studio located in Lexington Kentucky. We have everything needed for your session, including hats, headbands, wraps, props, etc. All you have to worry about is bringing your baby and we will take care of the rest! I like to see newborns within the first 3 weeks of birth so that I am able to pose them while they are still in that sleepy/milk coma stage :) We only accept a limited number of newborn sessions per month - To hold space on our calendar for around the time of your due date, a completed policy agreement form & payment a non-refundable retainer are due at booking. Then once your baby is here, we will schedule a date/time for your newborn session to take place. All newborn clients receive a detailed prep guide that is filled with everything you need to know about your session. The fall & holiday photo season is starting to wind down over the next couple weeks and I am really looking forward to having some time to share all of the gorgeous babies! Camden came back to see me for his 6 month baby photography session here in Lexington KY and I seriously could not get over how big he had gotten since his newborn session! Watching these babies grow is THE most rewarding thing about this job! I’d say he has grown just a little bit :) I love these before & afters! Baby photography sessions take place either in our in-home studio located in Lexington KY or outdoors on-location at a park, field, etc. We have outfits available for your little one to wear for their pictures, as well as hats, headbands, props, etc. I recommend scheduling baby sessions for the milestones that your baby accomplishes throughout their first year: Tummy Time (3-4 months old), Sitter (6-7 months old), Crawler (9-10 months old), and of course 12 months for their 1st birthday. Love this sweet sleepy baby boy all curled up! Our in-home studio is completely stocked with everything needed for the entire session - this includes hats & bonnets, headbands & tiebacks, rompers, suspenders & pants, as well as vintage & antique props, buckets, baskets, bowls, etc. All newborn clients receive a prep guide that is filled with everything you need to know to help plan for your session. Our hope for you is to be able to sit back, relax, and watch the magic happen with your sweet little newborn. 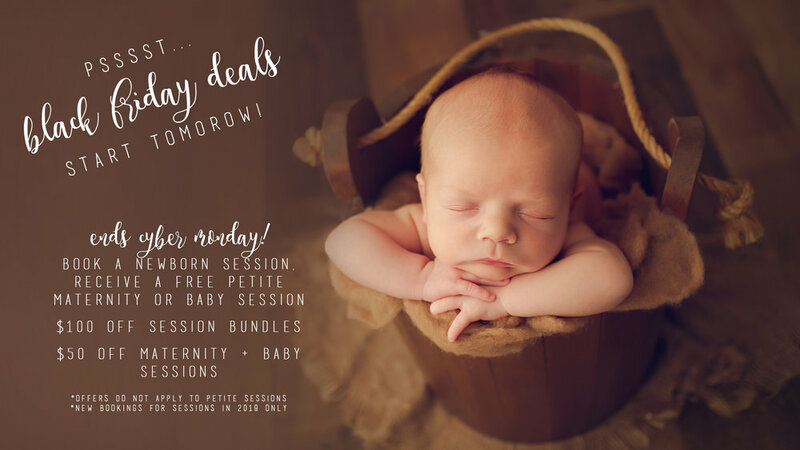 If you have been wanting a newborn session but weren't ready to invest in a full session or maybe you only wanted a few sweet little images...then this is the perfect session for you! 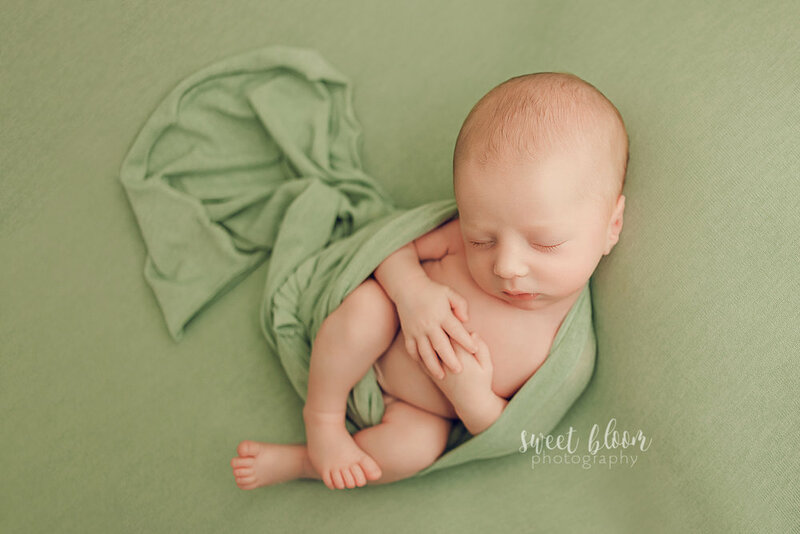 Petite Newborn Sessions are approximately 1 hour in length and include a selection of wrapped poses of your baby only. You will receive 5-10 retouched images to download for printing as you wish, as well as access to beautiful, heirloom quality products shipped directly to you. Newborn sessions are scheduled to take place within the first 3 weeks of birth. Since the actual arrival of your newborn is usually unpredictable, we hold space on our calendar for around the time of your due date. Once your baby is here, we will then schedule a date/time for your newborn session. To hold your due date on the calendar, payment of a $200 non-refundable retainer & a completed policy agreement form are required at booking. Upon booking, you will receive a prep guide that is filled with everything you need to know to help plan for the session. Ever since I moved to Lexington KY, I have had nearly all boy newborn sessions! I don't know if there's just something in the water down in these parts or what :) So when I do finally get a baby girl or 2 in to see me, you know I'm going to be all about the pink! 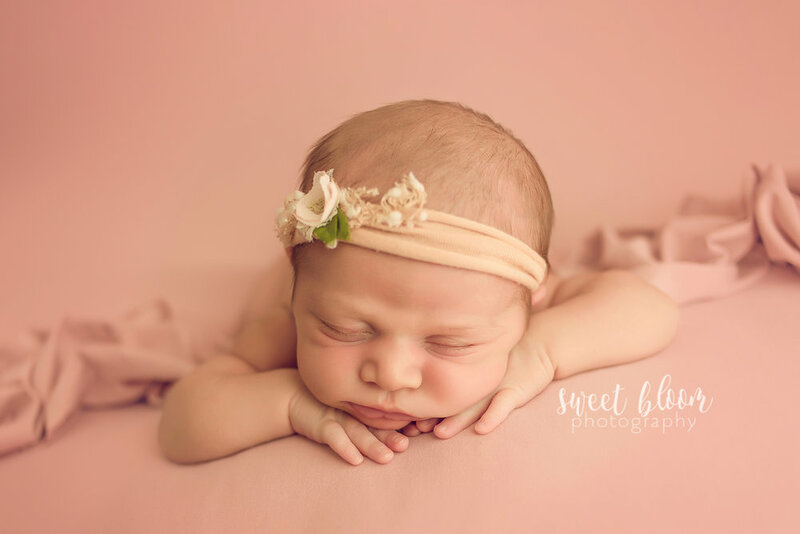 I just love this color on this beautiful baby girl for her newborn session! Those sweet little hands are just too much! I just love doing prop shots during newborn sessions! This little guy loved being wrapped and I was happy to oblige :) He naturally put his little hand on his cheek like that, so I just went with it! 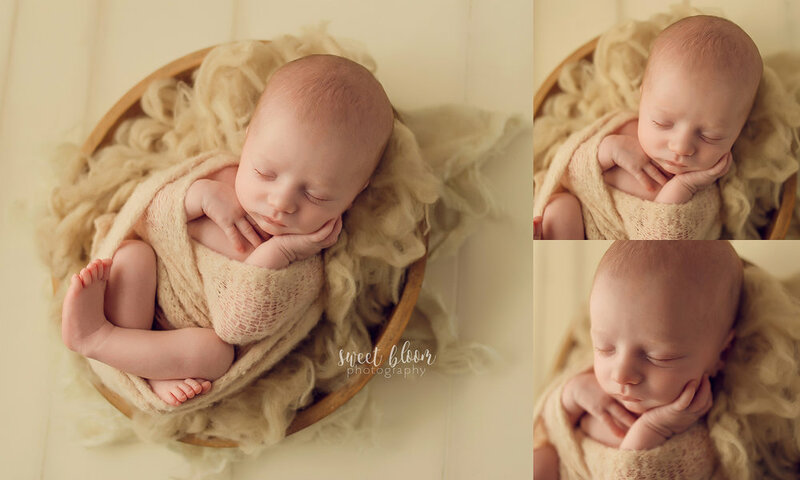 All newborn sessions include posing in props/bowls/buckets/crates/etc, as well as posing on a blanket/fur. I like to see newborns in our Lexington KY photography studio when they are between 7-21 days old. Your baby needs to be in that super sleepy, bendy state in order to pose them :) That time goes by so fast! This is definitely, by far, the most requested pose that I get from my clients during their newborn sessions :) It's called the "froggy pose" and it is actually a composite that I create in Photoshop. 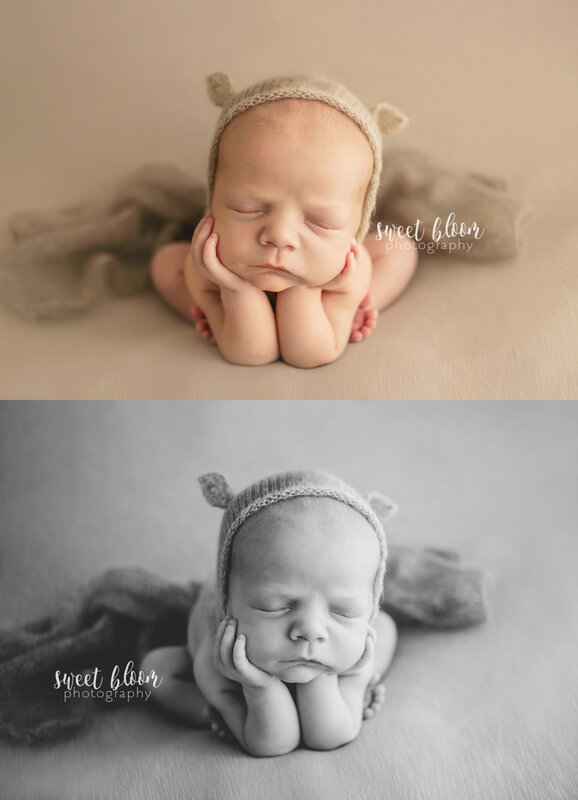 I take 2 photos of the baby (1 picture holding the wrists + 1 picture holding the head) and then I merge those 2 images in Photoshop and end we end up with this adorable shot! Newborn sessions take place in our in-home studio located in Lexington KY. Since the actual arrival of your baby is usually unpredictable, we hold space on the calendar for around the time of your due date. Then, once your baby has made its arrival, we will schedule your session to take place between 7-21 days old. I just love this little pose! Miss Alexis came to see me for her newborn session at our Lexington KY Photography studio when she was almost 3 weeks old :) I like to photograph newborns between 7-21 days, so she came to see much just in time! The studio is stocked full of props, headbands, wraps, hats, etc. We have everything needed from start to finish! Sweet Bloom Photography is an award winning newborn photographer (we have been named Best Newborn Photographer 3 years in a row!) with over 7 years of experience. I have gone through the necessary training to pose your newborn in a safe & comfortable manner. Since the actual arrival of your baby is typically unpredictable, I hold space on the calendar for around the time of your due date. Then, once your baby is here, we will schedule a date/time for the session to take place. I suggest booking your newborn session while you are still in the 2nd trimester. A limited number of newborn due dates are accepted each month, so we do tend to fill up months in advance. It's never too early to get on our books! 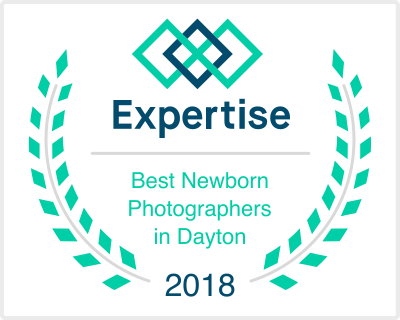 Sweet Bloom Photography is an award winning newborn photographer in Lexington KY - We serve the greater Central Kentucky area, including Georgetown, Nicholasville, Versailles, Winchester, Richmond, Paris, and other surrounding areas.